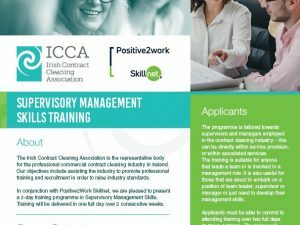 The 2018 Annual General Meeting of the Association was held on Tuesday 25 September in the Castleknock Hotel. 13 member companies were represented at the meeting, an event that offers members an opportunity to review the past year and the worklist for the forthcoming year. Avril McCarthy, General Manager of Derrycourt was elected Chairperson for the year ahead. 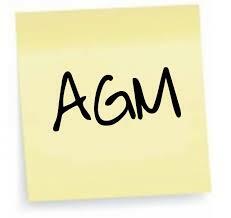 Minutes of the AGM are available for Members by logging into the Members’ Area. 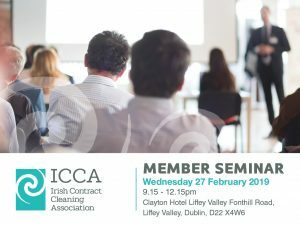 Members were pleased to welcome Adrian Cummins, chief executive of the Restaurant Association of Ireland, who spoke after the meeting in relation to issues, affecting both the restaurant and cleaning sectors, such as the availability of employees and the shortage of housing. 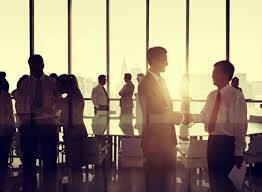 Members and ICCA Suppliers enjoyed a buffet after the event. 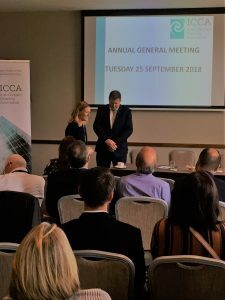 Pictured is incoming Chairperson Avril McCarthy welcoming Adrian Cummins, CEO of the Restaurant Association of Ireland as he is invited to address ICCA Members.